How to compress/reduce DVD movies to Multi-track MKV/MP4 within 4GB for Android devices? This article helps you rip DVD movies to Multi-track MKV files while keeping the output file within 4GB limitation for Android devices with SD cards which are FAT32 formatted. Question: How to watch multi-track movies on new Nexus 5? Download Blu-ray MKV movies to Android devices? You must install a third-party media player on your Nexus 5 beforehand; otherwise most Android devices cannot recognize MKV formats. Anyway, as we all know that you cannot transfer or play a movie file over 4GB to Android tablets including Samsung Galaxy Tab 3, Galaxy Note 3, Kindle Fire HDX, Nexus 5, new Nexus 7, Sony Xperia Z1, HTC One Mini, etc. since these Android devices only recognize SD memory cards formatted in FAT 32 which limits a single file size less than 4GB. While a standard DVD disc with a 1-2 hour movie on it usually is around 7-8 GB, and when you attend to rip DVD to Multi-track MKV/MP4 within 4GB limits, I believe below guide can do you a favor of finding an easy to do that. First of all, search for the best DVD to Multi-track MKV/MP4 converter, free download and install on your computer. Now let’s learn together how to encode DVD movies to Multi-track MKV within 4GB. Step 1: Run the Multi-track DVD Converter, hit the “Load disc” button and successfully import your DVD from disc drive to the app. 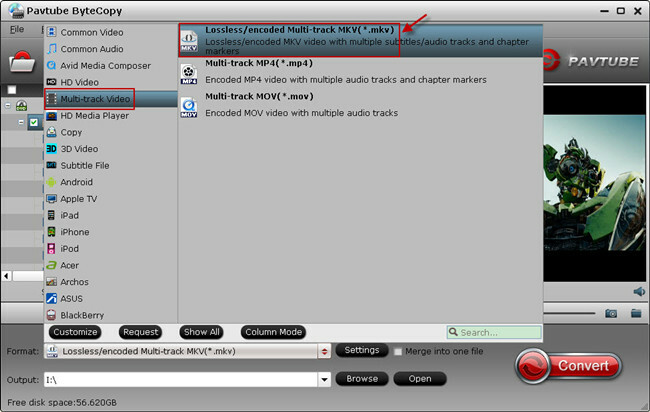 Step 2: To extract more than one audio and subtitle track in saved MKV file, choose “Multi-track Video > Lossless/encoded Multi-track MKV(*.mkv)” or “Multi-track MP4(*.mp4)” as output format. Step 3: Click the “Settings” icon on software UI, and you would see video part from original disc is not encoded by default. This helps backup DVD to MKV with lossless quality, but the created MKV files would be large size. To reduce output file size, tick off the “Encode” button, change Bitrate to 2500 and this program would compress your source DVD and export a Multi-track MKV within 4GB. Tip: Switch to “Audio” and “Subtitle” tab, you can remove unwanted audio and subtitle track by un-checking the “Check” box. Step 4: Back to software main UI, hit the big “Convert” button and start ripping DVD movie to MKV/MP4 with multiple audio and subtitle tracks for Android devices. 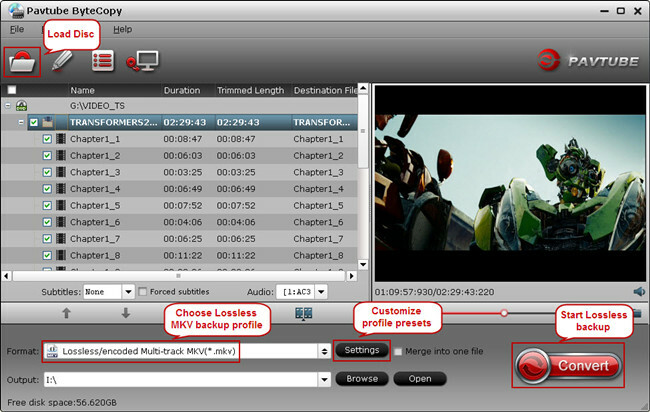 After 40minutes to 1 hour, you will get a complete Multi-track MKV or MP4 file by accessing to output folder. Now transfer the compressed 4GB MKV/MP4 video to SD card and watch multi-track movies on your Android device. If don’t receive message from strangers, please don’t forget to contact us for the discounted link via faq@pavtube.com.